Last month we talked about how cooking was a science and your kitchen was your lab. As I was writing that post I realized that I have never posted about my new favorite science behind the food cookbook. So, today’s post is for those of you that really love the science behind the food. 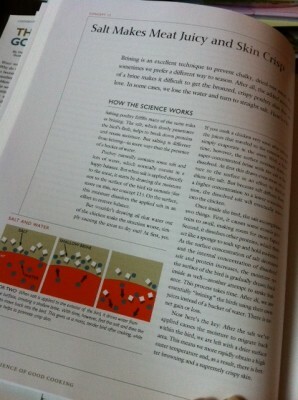 For my birthday, my husband got me Cook’s Illustrated’s new cookbook The Science of Good Cooking . 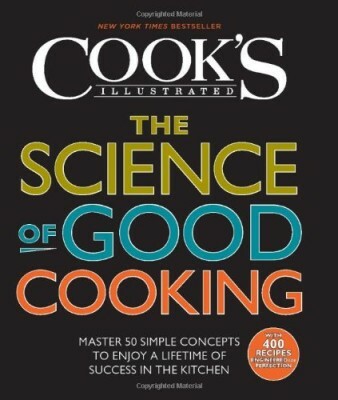 He knows I like the science behind food and he knows I love Cook’s Illustrated and Cook’s Country. And the cookbook is not all that new, since my birthday was last year, but it is one of their newer ones. The Science of Good Cooking is done in the typical Cook’s Illustrated Style. They give the recipes with the how’s and why’s behind it. What is a little different about this cookbook though is what it contains. This cookbook is more about the basics and how to’s of cooking. Their magazines and other cookbooks are a little more random and wide ranging in topics, this one is a how to really master the basics type cookbook. They talk about cuts of meat and how to keep meat really tender. In fact, one of the things I love about the book is that it contains a lot of information about meat. Meat is the focus of many meals, but it can often be tricky to get just right. This book gives the basic techniques and how to’s to perfect cooking meat. They cover the different types of potatoes and dealing with all the starch in potatoes, sauces, cooking with wine, herbs, chilies, cooking the best beans, leaveners, cakes, and more. It is all in this book. And more. I will admit that I have not made any of the recipes in this book, but if they are like the other Cook’s Illustrated recipes they will be great. What I use and love this book for is the information that this book contains. The techniques, tips, and ideas can be applied to almost any recipe. It is in reading these types of tips and ideas that help me make my recipes better. It is how you learn to perfect recipes that you already love. If you love the science behind food and perfecting recipes, I think you will love The Science of Good Cooking . If you know someone that loves the science behind food, this would make a great gift.